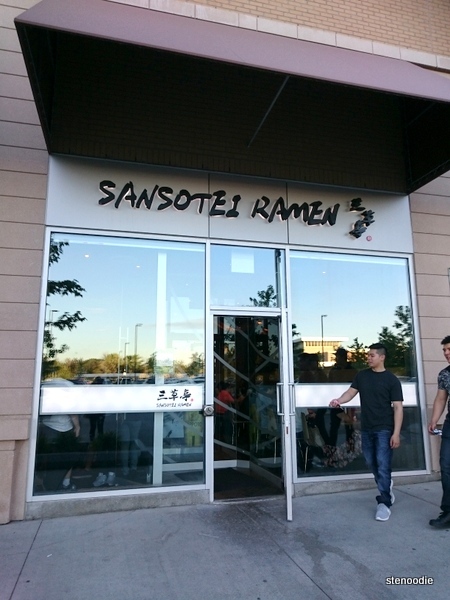 This was the third of four Sansotei Ramen locations in Canada and one of the physically largest locations. When you walk in, there is a deep dining room full of booths and tables for customers to sit in. The high ceilings gave a very comfortable vibe and was definitely more spacious than the first downtown Dundas location (which I’ve been to). Two friends and I dined here for dinner on a Wednesday evening at 7 p.m. and after a few minutes waiting, we got a table for three near the counter and kitchen area. 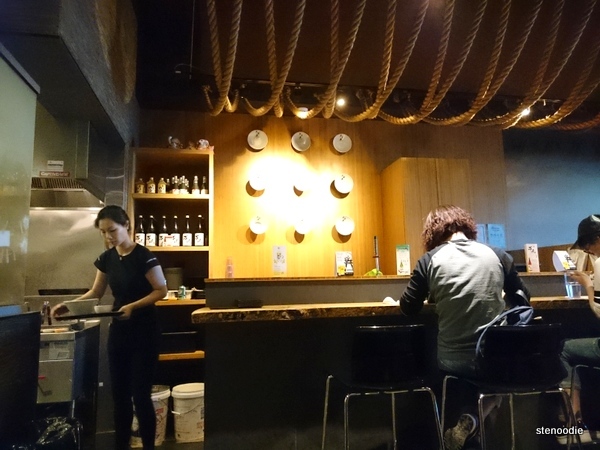 Their menu is simple with just a few choices of their ramen. You can read all about their history and ramen here on their website. 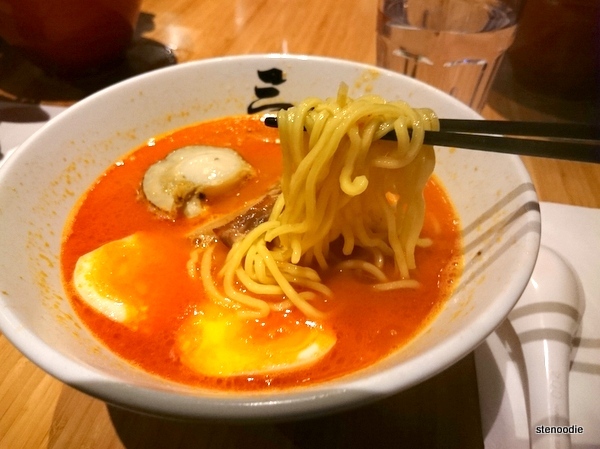 On this visit, I chose the tomato soup base which came with pork belly, scallop, tomato, egg, shiitake, and a choice of thin or thick noodles. I don’t usually choose tomato soup bases for ramen but I wanted to try something different this time. I chose the thick noodles too as their website recommended thick noodles to go with the tomato base. 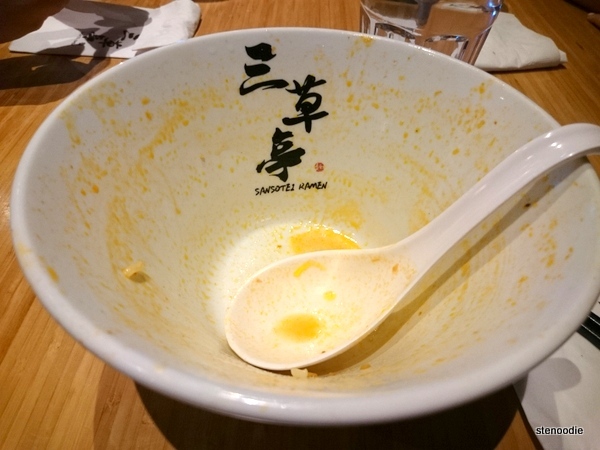 After we placed our order, the bowls of ramen came out very quickly! I was actually quite impressed with the tomato soup; it definitely tasted of fresh tomatoes and was a very clean soup broth that I finished up completely. 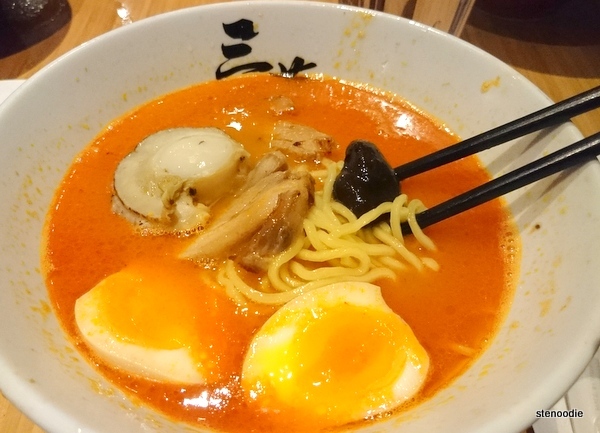 Normally, when you finish up the broth in a ramen broth, you are extra full, but since it was tomato, it tasted so clean and great. I didn’t feel too full bloated afterwards either. In this photo, you can see the scallop, pork belly, shittake musroom, and egg with the thick noodles and tomato soup! The thick ramen noodles did go really well with the tomato soup and were just chewy and firm enough for me. The egg was so soft and tender; I loved the soft-boiled yolk. Definitely a very well executed soft-boiled egg. The scallop was nice and big. The pork belly was very tender and not fatty at all! The shiitake mushrooms were fresh and really good. 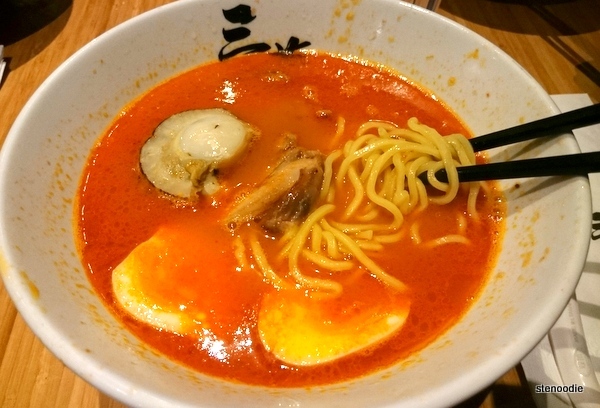 I really enjoyed my Tomato soup base ramen! Marilyn and Justin really enjoyed their Spicy Tan Tan ramen bowls as well. I liked how even when we were done our meal, the server asked us if there was anything else we needed, and when we said no, he gave us the bill and said that we could stay as long as we wanted and not feel pressured to pay yet. We did stay a little longer to chat but headed out soon afterwards. At that point, there was a line-up already outside the restaurant and close to ten people were waiting for a table. I appreciated that the server didn’t rush us out even though we were already done our food and could have left. That was really nice of him even though it was obvious they had waiting customers already. 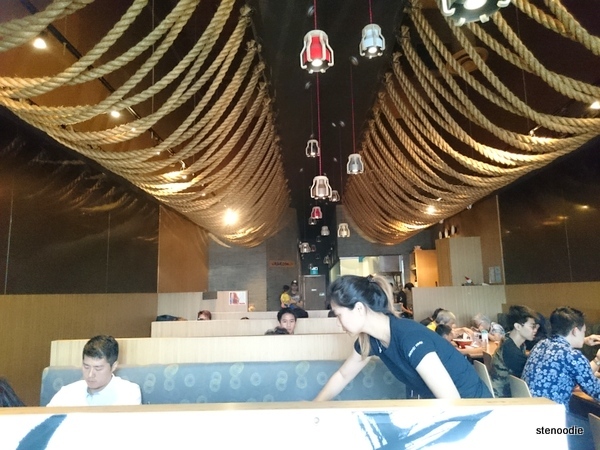 I returned to Sansotei Ramen Markham with some friends to have lunch here! It was really packed when I arrived right at 1 p.m. but luckily, that was also when the first group of lunch-goers had finished lunch and were leaving. I was about the 5th one in line — I even got a number as I waited in line — but got my table within 5 minutes of waiting. Awesome! This time, I wanted to try their Spicy Tan Tan which had a limited quantity each day. Unfortunately, I wasn’t part of the lucky few who got one of the limited quantities and had to order the Tonkotsu Black instead. 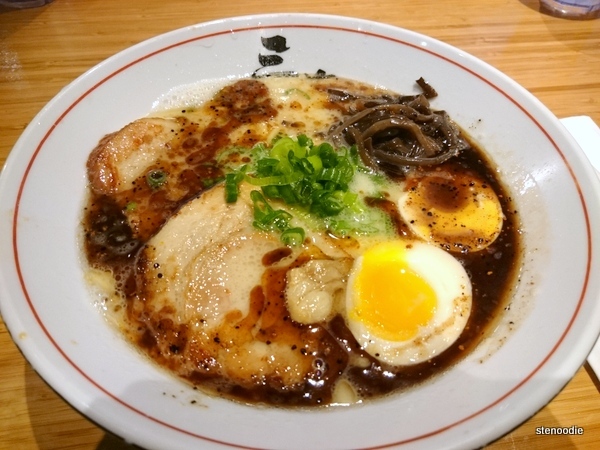 The Tonkotsu Black had everything that the Tonkotsu had (pork belly, black fungus, egg, green onion) with the addition of garlic oil on the top of it making the creamy pork broth even more flavourful and rich. 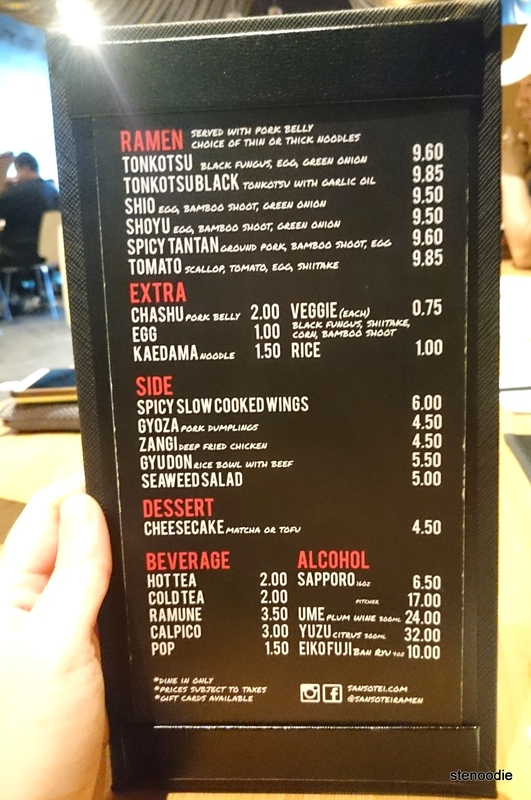 (I already tried the Tonkotsu Black before at the Dundas location). This time, I asked for thick ramen noodles. Our orders arrived in a reasonable time and the service was attentive — half-empty water glasses were filled quickly. 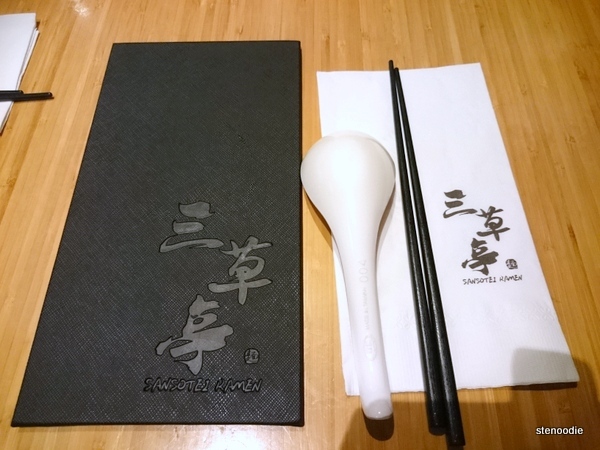 I really enjoyed the Tonkotsu Black! The broth was delicious, the pork belly was substantial (and fatty), the egg was so smooth and soft, the black fungus was crisp and fresh, and the thick ramen really had that ‘authentic’ Japanese feel to it. I never used to like thick noodles, but ever since having it made so well, I really enjoy it as much as the thin ones. 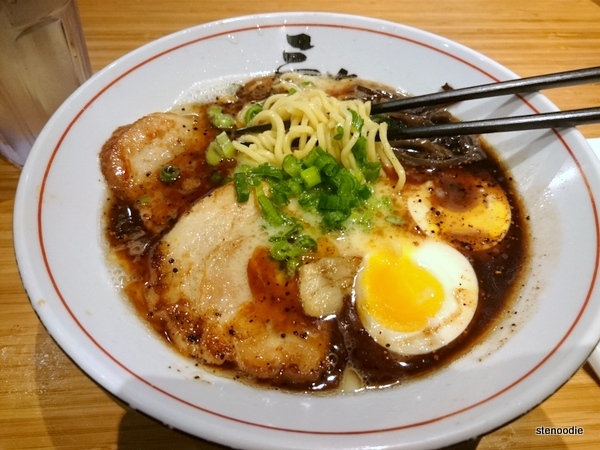 Yum, Tonkotsu Black with thick noodles! This entry was posted in Food and tagged 3987 Highway 7, @SansoteiRamen twitter, food blog, foodie, Japanese, Japanese ramen options uptown, Markham, ramen, restaurant review, Sansotei Ramen, Sansotei Ramen Markham, Sansotei Ramen Markham menu, Sansotei Ramen reviews Markham, scallop in tomato ramen, Tomato Ramen, Tonkotsu Black, uptown ramen. Bookmark the permalink.